Lip exfoliation is one of the best kept secrets when it comes to achieving super soft, kissable lips. Most of us rely solely on lathering lip balm, Chapstick or other products to keep our lips in check. But, exfoliating regularly will make them softer and smoother than they’ve been in ages. I’m a regular when it comes to exfoliation. I swear by it – and it’s one of my most important beauty essentials. There are some amazing body and facial exfoliating scrubs out there. The only problem I’ve run into is that most facial scrubs are too harsh for the delicate skin on your lips – and there aren’t many good scrubs or exfoliators specifically designed for your pout. So… here’s what I do. I use this ah-mazing homemade exfoliating scrub that is specifically formulated to be gentle enough to use on your lips. It is insanely easy, and most of you probably have all the ingredients in your kitchen as we speak. Want to use it too? Here’s how to get started. Combine the ingredients together in a small custard bowl or jar. *Note: I sometimes even use empty facial cream jars so that I can make a little batch and set it on my bathroom counter. Sometimes I’ll double the recipe and that gives me enough to use the scrub a few times before making another batch. Apply a bit of the scrub using one or two fingers to your lips. Gently massage in tiny circular motions (rotating directions after a bit), for about 2-3 minutes. *Note: You will see better results if you can apply the scrub right after showering or washing your face (gently pat your face dry before applying). The warm water softens your skin and any dry, dead skin will smooth off more easily. Rinse with warm water once finished. Use warm water and a washcloth to remove any extra scrub. Follow immediately with an application of Vaseline, Chapstick or a high quality lip balm. This will help lock in moisture and will condition that fresh, new top layer of skin. As with any scrub, limit your sessions to once or twice a week. Exfoliating more often than that can irritate and even damage your skin. The fresh skin you uncover is soft and more sensitive than those top layers of tough, dead skin that would be there otherwise. And.. to protect your baby soft skin from additional damage, don’t forget to apply sunscreen daily. Yes, on your lips! Though most women don’t realize it, our lips are especially susceptible to sun damage. Using a lip balm with SPF will help prevent dry, damaged skin – not to mention skin cancer – and you’ll have an easier time keeping your pretty lips in perfect condition. Expired: Sephora Collection Ombré Obsession Eyeshadow Palette Giveaway! $175 Value! I already tried your avocado face mask and loved it. I am going to try this too, I love handmade skincare items. This sounds great. Thank you for sharing this with us. I tried this and it worked great! Thank you for sharing. I will definitely have to try this! My lips are always so chapped! I do this! I am too broke to afford lip scrubs (which is too expensive imo!) but when it comes down to it, all of them contain oils and a exfoliating substance which is basically what homemade sugar scrubs are! I have yet to try this! Such a popular DIY, I think I should go for it 🙂 thanks for sharing! i tried this, my lips were so smooth! I had no idea you could exfoliate your lips that is great will definitely try this ! This sounds like a better than a previous version I’ve tried before. Having chapped lips is second nature to me so this trick is real nice! Thanksss! Going to try this on my dry lips. This will be a nice scrub to use this winter, going to try this! Thank you! 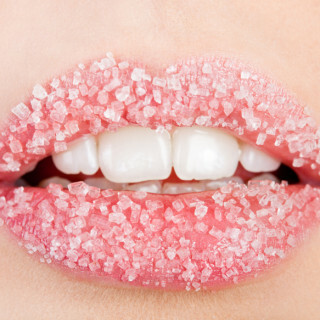 I’ve been looking to make a sugar lip scrub recently, ill be sure to try yours. Great recipe – I have everything in my pantry, so I’m trying this out tonight! I’ll have to try this, my lips always feel better after a scrub. I’m going have to make this!! This is a good DIY to make when my lips get all dried out from going in and out from the heat to the cold weather and my lips suffer from it. What a great solution!! Love love love this D.I.Y!!! I don’t use warm water to wash the lip scrub off but instead I just lick it off since it’s made with sugar, honey, and olive oil. I tried this! It worked so well! I made extra to keep on hand. This sounds like just what my lips need right now! I will have to give this a try, my lips get so dry! I like that is contains cinnamon. I’ve never tried to make my own lip scrub. Love this DIY!